The song stuck in my head this week is “Celluloid Heroes” by The Kinks. It is unapologetically nostalgic and verges on mawkish, but that is the point. After the horror on Friday in Newtown, I heard this on Little Steven’s Underground Garage and settled into its familiar comforts, but not for long. The song got me thinking about whether the murderer of those 27 people in Newtown was seeking the same kind of fame. If so, the media surely gave it to him. Notice I did not use his name, and I won’t. His name should be forgotten. What we should remember is that we allowed this to happen, and we will allow it again. We live in our own reality shows. The Newtown killer ended his season hoping for the best ratings of his pathetic life. It is certain that he did not come to this eruption of rage alone. We will learn every facet of his life: whether he was mentally ill or abused or bullied, on medication, and whether he was taught to shoot by the mother he shot while she slept or not. I already know that he shot each victim multiple times, thanks to his military-style rifle and hi-cap magazines. I am a gun owner. I have fired guns since I was a child. My father had an unhealthy interest in guns to the last act of his life. I myself flirted with “tactical fetishism” as I will call it. We worship the military and the militarized police. Did you call the mass murder the “shooter”? Did you think “double tap” when I said he shot children twice in the face? Why do we glamorize it? This isn’t meant as a deflection against the argument for stricter gun control. Mental health care is one part of the issue. Read my friend Chad Eagleton’s post about his violent mentally ill brother, whose only treatment option appears to be life in prison. Another good read is by my friend Neliza Drew, who also grew up with guns, and sees that despite the protests to the contrary, we no longer see them as tools. To quote Marc MacYoung–who has most likely been shot at more often than you have–to many of us, guns and other weapons are talismans against fear. Violent crime is down, yet fear is at an all-time high. Kids play indoors. We don’t walk the streets. We bought 283,000 guns on the Friday after Thanksgiving alone, and I am sure the gun shops are doing great business after the Newtown massacre from frightened parents and gun lovers afraid of one more law. The fact is, the guns used in this massacre, the Aurora massacre and the Clackamas mall massacre were purchased legally. So your “criminals don’t obey laws” argument is invalid. Even in New Jersey, one of the strictest states, there is no differentiation between a shotgun for hunting and a military-style rifle. NJ has a 15 round limit on magazines, but you can buy them online, have your 100 round Beta-C mag shipped to a buddy in Pennsy. Why not a waiting period for any military style weapon? The 2nd Amendment? The Constitution also says I have the right to assemble for a petition of grievances, but I need a permit to protest or hold a parade. I may be caged in a “free speech zone.” I find that more offensive to the rights supposedly protected in the Constitution and Bill of Rights than asking me to undergo a psychological evaluation before I purchase an easily concealable weapon or a military rifle. No one began hunting with military rifles until the Assault Weapons Ban was lifted, because gun owners wanted to justify our fetishism of military-style equipment. We didn’t want a sporterized rifle. Those look lame! We want the same toys you get if you undergo military training, without the responsibility. We want a mil-spec wristwatch and a tactical pen. 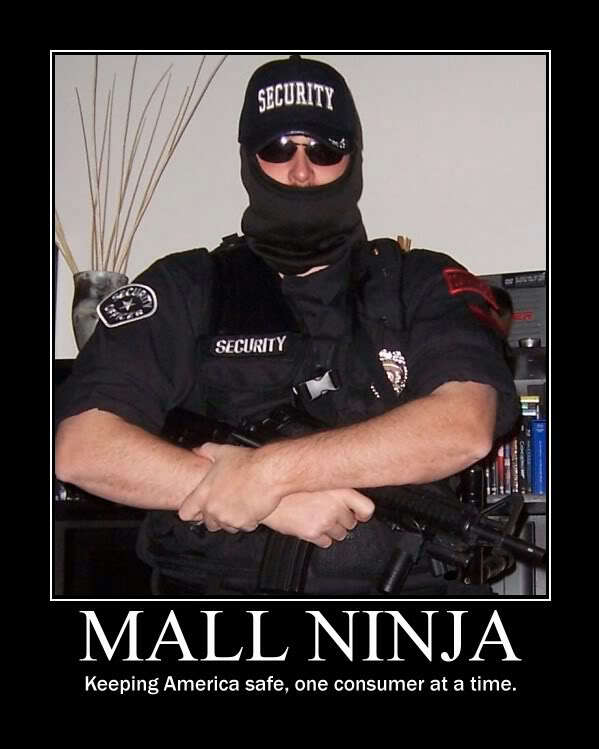 A few years back gun owners made fun of the tactical violence geeks–we called them mall ninjas–but now they have taken over. Doomsday preppers. Bug-out baggers. Fear junkies. There are 270 million guns in America, and depending on your definition, 10 to 30,000 deaths due to them annually. Cars kill more, but you need a car to get to work. And you are licensed, registered, and tested. And our car regulations are some of the laxest out there as well, which is one reason we have so many traffic fatalities. We need to have realistic laws concerning the most dangerous of weapons. A shotgun without a pistol grip is a hunting gun. A .223 semi-automatic rifle with a pistol grip is a military weapon. Personally, I think we should be able to own them: with proper licensing, training, testing and psychiatric evaluation. You can own a machine gun in many states. They are so highly regulated that they haven’t been used in a crime since the law was enacted in 1934. Not so, with the “safer” semi-auto versions. Why? The regulations. It is a very emotional time. We should use this emotion to force a conversation about guns and our refusal to treat them in a rational manner. This is from someone who fired a Thompson submachine gun with his groomsmen. I like guns, I just think we can get them too easily, and we like them for the wrong reasons. Changing the culture will take decades. We see guns as magic wands, and violence and revenge as valid solutions. Changing that takes generations. Limiting access to military-style weapons can be enacted in a month with the proper will. If you believe strongly enough in gun control, you will not waver. You will not be distracted by another issue next week. You will not vote for the NRA’s poster boy because he also wants to lower your taxes. You must have focus, on one issue, like the NRA does. That is why they are so powerful, not because of some cabal of rich conservatives. They tell politicians “vote for gun control and our members will vote against you, no matter what.” Those tactics must be used against them. Stop signs and traffic laws don’t protect us from all accidents, but what road would you rather drive on? One with state troopers hiding in the bushes and lines painted for the lanes, or in Russia, where you make rules?